Tune Up and Repair Additives from Mega Power that improve performance to please customers with a run racy, stronger engine feel. Tune up and repair additives: Shown above, our method of 1 of 6 in our tune repair kit product that instantly provides horsepower boosting, tire burning performance to engines pass 100,000 miles. Clean every internal power-robbing, dirty part! With 6 powerful restorative cleaners and conditioners, the above tool is our holistic way for the car owner, and mechanic. Order patented cleaner feeding device shown hanging from hood. Cost $125. Speeds up cleaning when in the shop. while other additives clean dirty, power-robbing motor parts where ever air fuel exhaust and motor oil goes. These new engine tune up and repair additives from Mega Power can now skill the feeder tool, as they are not needed with our improved tune up and repair additives in the 6 item treatment. What's included in the 6 item tune and repair additives treatment? A "fuel tank, filter, and fuel injector cleaner" with conditioners for anti-wear. [$69 value] Add to fuel tank. A Combustion area "carbon remover" to clean sticky valve heads, top piston rings, plugs and sensors cleaner to remove power robbing carbon, and compression lost. [$69 value] Add to fuel tank. A motor oil cleaner which frees sticky lifters and valve stems and lower piston oiling rings. Quiet tapping and all engine noise. [$49 value] Add to motor oil. A sludge removing cleaner with acid neutralizer. Liquefies residues and removes sludge for instant total clean so new oil protects the motor helping new oil do so, in a better way. [$69 value] Add to motor oil as step 2 a week after top of motor cleaning given as 1,2,3, above. A Friction Modifier MC+ to add to the new oil after cleaning of 4 above. [$49]. Add to motor's oil. service as they contain much stronger products from chemistry. By adding the Mega Power Engine and Transmission Tune Up and Repair Additives to the engine and transmission you dispel and remove wear-increasing troublemaker negatives that sap horsepower and shift negatives time and wear take away! You have at hand an effective way to instantly restore 20% more horsepower - the amount lost to time. dirty conditions, wear, and friction. This Mega Power Tune up and Repair Additives enhancement is the secret a few car buffs, car owners, and a few race cars owners know provides the edge to run better, stronger, faster. This product will produce engine tune up like results new parts can't as well as end motor and transmission shift and power decline, tap, oil burning, shift leak problems. Before repair, perform the install of the products. After 10 minutes dismantle and perform repair. Into the new oil or fluid add the protectors in the treatment as specified. Oder now! Choice of helping motor, or helping motor and transmission. Mega Power Engine Tune Up and Repair Additives Treatment for your motor. Enjoy the total tune and repair additive treatment for superb, instant cleaning needed, with friction reducing advantages to, or as your tune-repair service. The install is easy and chemically RESTORES a powerful, like-new, racy performance customers thought that time and wear took away. Something only Mega Power can provide! Mega Tune and Repair Additives Motor Treatment as shown, 6 items needed. Delivered to your door in 3 days, with easy-to-follow directions, Phone help if needed, Guarantee. Click cart button to make purchase. One Mega Worn Motor Treatment 6 items as shown. $80 plus $15 s&h= $95 total. And 3 items for your transmission. Just $75. Both delivered to your door in 3 days, Phone help if needed, Guarantee. Just $170 for both treatments - Order now! 9 items total. Now just $140. Save $30 sale! Tune up and repair additives: Shown here is the old fashion way to clean fuel injectors. See device hanging from hood of car as mechanics wait for the product to be consumed by the engine. New products listed As engine tune up and repair additives from Mega Power do not need this type tune up and repair additives service as they contain much stronger products from chemistry. By adding the Mega Power engine tune up and repair additives to the gas and motor oil you have at hand an effective way to make cars run better, and years longer. As you read this report, you'll see which products produce engine tune up like results an end motor transmission wear power decline, tap, oil burning, shift leak problems. Mega Power Engine Tune Up Additives have both superb cleaning and friction reducing advantages that chemically RESTORE a like-new performance, you may have thought was worn away. I love that revitalizing advantage - and so will you! One Mega Worn Motor Treatment 6 items as shown. $80 plus $15 s&h= $95 total. And 3 items for your transmission. Just $75. Both delivered to your door in 3 days, Phone help if needed, Guarantee. Just $170 for both treatments - Now just $140. Save $30. Order now! 9 items total. Here is your introduction to new products that will end your engine, transmission, steering, and A/C wear caused performance problems. Because protection and problem ending advantages work using new anti-wear and chemical cleaning ingredients, you will end wear and performance problems not possible before - except by costly hand cleaning during a $2500+ overhaul by a mechanic. But now easily doable with Mega Power. Let me explain how to order Mega Power and install it easily to save you lots of now avoidable internal wear and residue caused problems that costly overhaul use to end. Wear and power decline, engine valve tap noise, oil burning, and oil leaks - rough shifting, slippage, and excessively hot temperatures, often, in minutes! Compared to common solvent-based engine tune up and repair additives, that are harmful to today's motors, and thick honey-like additives - when today's cars run on water-thin oils; sold in part stores and quick lubes. Mega Power engine tune up and repair additives are installed in both new, rebuilt, overhauled and even your wear-worn engine and transmission. Both new and older pistons bearings and gears - end over a dozen performance decline problems, with an instant zip in performance due to friction lowering advantages that again pass horsepower to the gears and wheels - no longer absorbed! What you should order is the engine transmission treatment. 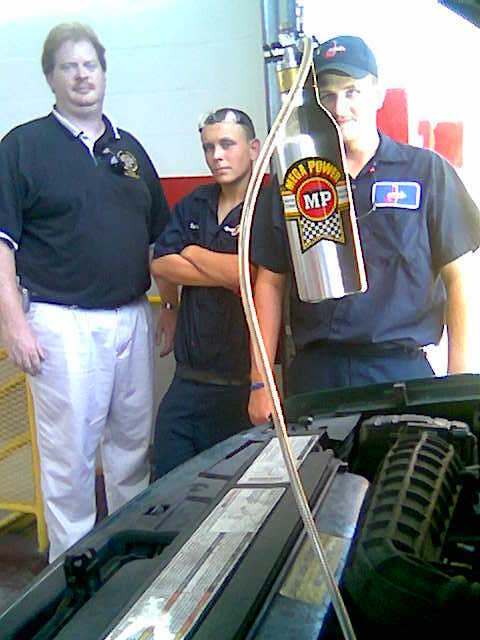 Mega Power engine tune up and repair additives for the engine uses 3 products to clean and condition the top of your motor - from gas tank to exhaust tip. The transmission treatment uses 3 products to clean stuck shift valves as it adds a slippery protecting film for even smoother shifts. 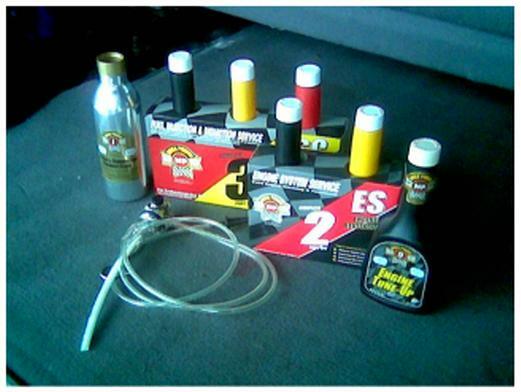 Order engine tune up and repair additives below. Phone help is also available if you have a question, and to order by phone, at 512 665 3388. Our Mega Power tune up and repair additives is a treatment using 3 to 6 items specified to end your cars wear and tear problem. 6 for motor. 3 for transmission. 3 for radiator. 2 for power steering. They are also installed as a new car warranty service product to meet the new car warranty, but exceed factory product features. Mega Power provides a simple 2 step easy install method. Nothing to take a apart. Men and women get professional results. The Treatments ends over 20 wear and performance problems by using special problem-solving ingredients - in a certain way - as shown. Mega Power tune up and repair additives success is due to 4 new, extremely powerful "chemical cleaners," and 2 "friction modifiers," called MC+. Those ingredients clean and recondition problem-causing areas where oil can't, to remove problem-causing sludge, and end friction-causes of performance decline. These engine tune up and repair additives work in any size new vehicles, and older Hi-mileage ones, too. These engine tune up and repair additives have anti-friction and friction reducing benefits that protect your motor as their cleaning advantages work. Also, a power producing improvement. Read that again, if you will. Those engine tune up and repair additives advantages work by smoothing worn surfaces - a friction reducing benefit that releases power that use to be absorbed by friction. For this reason, Mega Power makes your car go a bit faster - like it did when new, and friction was at its lowest point! A coating of co-polymer on every part afterward, fills worn spaces, so every part again slides free and like new again. This is the help you need to end your car problem with. Introducing the new Mega Power Tune Up and Repair Additives Treatment. Mega Power Engine Tune Up Repair Additives is an instant effective way to make cars run instantly racy better, and pull stronger. The treatment ingredient makes possible to end your car problem and a like-new running car, for years to come! Order now! Get Mega Power delivered to your door in 3 days by FedEx. $80 plus $15 s&h= $95 total. And 3 items for your transmission. Just $75. Both delivered to your door in 3 days, Phone help if needed, Guarantee. Just $170 for both treatments - Now just $140. Save $30. Order now! 9 items total. Order for 2 motor and 2 transmission treatments and protect both cars, save $90. Get 2 our our best radiator conditioners, a $40 value free while supplies last with this Get-Acquainted Special! Just $280 for the total. 20 items total needed. Save $90. Call if you have a question, or to order Mega Power. Call day or evening to my cell phone at 512 665 3388 ...george. Pictures showing these new products, and how they work. Simple directions explained, and ordering info given. That is how to end your car's internal, problem causing conditions. Details cover and explain the cause and how the remedy works for your education. It's a simple way to end more than a dozen performance problems not possible to end before. A short video, and educational links are included. You are directed to the product that ends your auto problem. Spend a few minutes reading how to end your problem and gain a lifetime of car-care problem-solving, problem-preventing tips for free! Mileage, wear, friction, and oil-breakdown caused problems. Oil breakdown sludge causes your performance problems and much faster friction wear out! Our product removes those sticky residues and end negative friction like no other product made - or can! They reverse what occured chemically. This ends your car problem. Problems causes.... Residues and friction negatives. Oil breakdown residues are too sticky to drain out during oil change. They start one set of problems, and need to be removed. And friction grows - as moving parts rub, to cause you other problems. Friction increases, not decrease with each oil change. You have been told your oil and regular oil changes prevent those kind of problems you now have. Do you really think that is so - No! Those sticky, friction increasing negatives are plugging your motors and transmission piston and "O" rings - causing more blowby, and plugging oil passageways to your valves and their lifters. There-in are half of your problem our product correct. These new products, called Mega Power, will clean, free, and open your motors oil [and transmission oil] passageways. 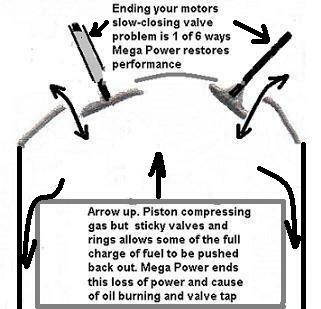 Then heal your piston, bearing, valve, and gear friction-roughen surfaces - that ends your problem - or is the problem to end. Problems like transmission rough shift, slippage, leaks, and your engine valve tapping, oil burning, power loss. They end the dread of thinking your transmission or motor is worn out - when its just needs cleaning and revitalizing - which reducing friction with MC+ and their cleaners do very well. Problems that sooner or later will cause you those $3000 motor or transmission overhauls, years sooner than expected. Doing so our way restores years more dependability and a renewed driving satisfaction. Isn't this the type of product you need to end your car-care problem? Hundreds of thousands of car and equipment owners think so and follow our simple, self-paying method of ending their car worry and problem our way. Read some pages on the site to see for your self, then order the products you need. I've made them easy for any man or women to use and end the problems of wear they are experiencing. Book mark this page. Click the buttons on the left. Order what's recommended for a new thrill to car care and problem solving. Remember, an engine repair can cost over $2000. Our method cost a fraction of that amount! The new Treatment does so for under $100, if you install the product yourself. Its easy. I'll walk you thru it. Its $150, if a mechanic installs the product and most will do so. That is still well worth it if it helps you avoid or put off for a long time. Mechanics often call me for directions. That is good. Otherwise, just add to oil and gas and drive. Driving does the fix. No special skill needed. Nothing to take apart! Order now! Get Mega Power delivered to you in 3 days by FedEx. $65 plus $15 s&h= $80 total. Order for 2 motor treatments, save $25. Just $135 total. Adding new friction modifiers, and special protective coatings to every part. These Mega Power friction modifiers - anti-wearers, and special protective coatings, grouped by the name of MC+, have been found to clean, smooth, and heal wear-roughen pistons, bearings, valves, and gear surfaces. They somewhat return the like-new micro-smoothness your car and equipment pistons, bearings, valves, and gears had when new - before the onset of wear and friction-drag caused problems. In doing so, these tune Up and Repair Additives from Mega Power improve performance also please customers with a run racy, stronger engine feel. A revitalization of your motor's former, great running ability again. Is this the type of product that will end your car-care problem? Hundreds of thousands of car and equipment owners think so. Join this group! Order these products today, below. We will show you which is right for your problem. Shipped to your door in 3 days by FedEx, with instructions and out foolproof guaranteed, and phone help, if needed. The leader in this field is Mega Power. Mega Power ends motor and transmission wear caused problems, power decline, tap, oil burning, shift, leak, and such problem. This picture shows 3 of 6 internal problem areas that Mega Power cleans, frees up, and friction modifies to end those internal caused problems. ... you may be one of those, like me, who chose to spend way less on a stop-gap product that ends performance problems, and also gives back a few more years of good driving dependability. New products can now penetrate those areas where weaker products and oil cannot. Special ingredients then go to work to eliminate the cause of your problem, and thereby restore your motor's - and transmission's former, great running ability again. Mega Power is a treatment you can easily install into your motor. It is installed in 2 easy steps. Step One ends problems a costly repair would otherwise be called upon to end. If you don't wait till its to late! Step Two reduces friction by smoothing rough, worn parts. Then coats those worn areas so every part slides clean and operate like new again. Transmissions have a near identical cause for their problems, of which Mega Power eliminates. Install time takes less than 15 minutes. Worn areas are coated to fill worn-away surfaces. Those advantages are what makes for ending your problem, and for restoring your cars great running ability again. Those advantages end wear, power loss, sticking, rough shift, and performance decline caused problems. Works in any car, truck, tractor, and RV motor to end their wear, Hi-mileage, and performance problems. This is the best and easiest way to end wear-causing, or residue-caused power decline, noise, tap, oil burning, and even oil seal, or gasket leak problems. Reduce, eliminate, or put-off those $1000 to $3500 motor repair needs. Of course, if broken, fix first. However, in sound running - but older, and even worn-out motors, this product puts off the need for a costly $4000 overhaul, often for many years. Imagine the good that causes! Pour-in. Drive. Driving ends or reduces the problem in a few miles. As a mechanic's repair aid. Also installed as the inside medicine to end power-robbing friction, low oil pressure, low compression, and valve tap, valve lifter problems. Now, you're able to get back in a few miles of driving, what years of wear and miles took away, for a return to near like-new performance again. Something, just replacing new parts next to older, dirty ones, having lots of friction could never do! Impresses customers such, they come back for more Mega Power b-split-test for all their cars. Are worth 10 times their small cost - which is often returned to you in new fuel and oil saving advantages. Price sure to go up soon! And down the road in time, by extending the time before repair or replacement is needed. Great new Mega Power inventions that avoid problems, end worry as to what to do next. bring back driving satisfaction. Ordering The Mega Power Motor Treatment. The easy way to end your valve and lifter noise and tap power loss, and oil burning problem fast. As you can see, this is a good car and budget saver. A good invention. Order a couple treatments today, and get on with life. The metal item in the picture is a handy tool for mechanics to install Mega Power into the motor automatically - while doing other work. Just $125. Ask for this tool when ordering. Otherwise, follow my simple tip for doing so, in the instructions. Call for help if needed. Order for 2 motor and 2 transmission treatments and protect both cars , save $90. get 2 our our best radiator conditioners, a $40 value free while supplies last! Just $280 for the total. 20 items total. Save $70. For large truck engines quantity size, go here. Includes easy-to-follow instructions, my guarantee of satisfaction, my personal phone help, if needed. End your transmission - stick shift, or automatic, and 4X4, and differential component wear, power robbing, noise causing, rough shift, leak, and overheating problem with this Mega Power b-split-test treatment. Reduce, eliminate, put-off costly repair, maybe avoid overhaul. Packaged this way for leaks. Call me and order these products now! I'm so confident in them, I guarantee them! You will get your money back if they fail to please. Please note: Only one refund requested last 267 days. One Mega Power Transmission Treatment. Pictured above. Includes 3 items, easy to follow directions, and my phone help if needed during installation. Satisfaction Guarantee. 2-4 day delivery time by FedEx. Cost: $50+ $15 s&h= $65 total. Each. Order One Mega Worn Motor Treatment; 6 items, and one Mega Power Transmission Treatment, 3 items and save $20. Order both sets for $125 total, including shipping. 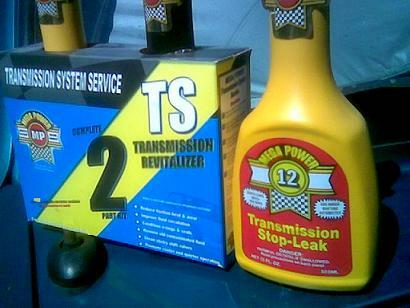 Two Transmission Treatments for two cars or trucks. 6 items. $95+ $15s&h= $110 total, for two sets. Six Transmission Treatments for 6 cars. For fleet or auto repair usage. $240+$20s&h= $260 Total shipped to your door or business. 2-4 day delivery time. Mail: Include your problem, product wanted, delivery, phone info. Pay by check or money order, when ordering by mail. End b-split-test motor transmission wear problems with new Mega Power products.